As as very limited-time nod to the holiday season, Starbucks introduces the new Christmas Tree Frappuccino, which is only available through December 11, 2017 at participating locations in the US and Canada. 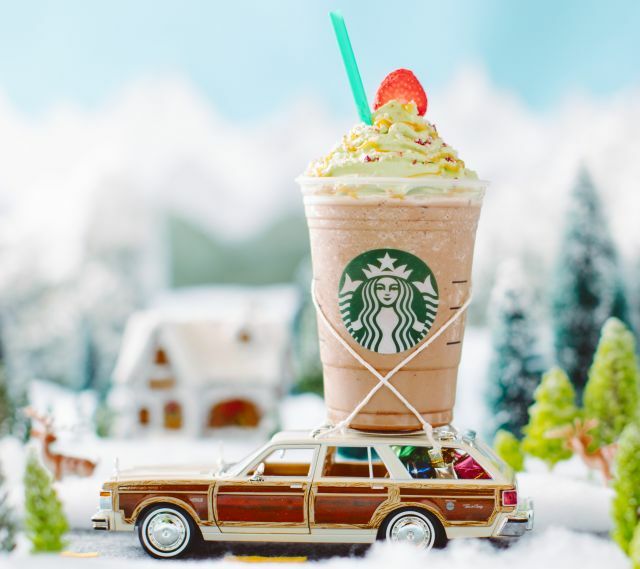 The frosty beverage features a Peppermint Mocha Creme Frappuccino (milk, ice, Creme Frappuccino syrup, mocha sauce, and peppermint syrup blended together), topped with a matcha whipped cream "tree" that is decorated with a caramel drizzle "garland," candied cranberry "ornaments," and a strawberry "tree topper." It looks like Starbucks might make a habit of doing very limited-run Frappuccino flavors during the holiday season. Around this time last year, they were offering the Fruitcake Frappucino complete with a ugly sweater cozy.